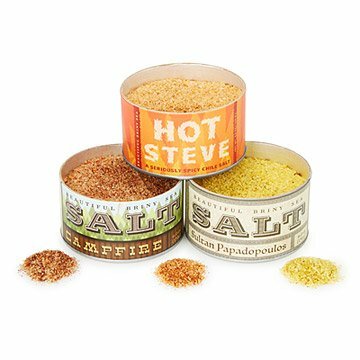 Create spicy sensations with this set of three handmade salt combos. When was the last time tiny, grizzled-but-adorable cowboys appeared over your table, huddled around a miniature campfire, giving you a thumbs-up and bellowing, "Huzzah!!"? Suzi Sheffield's magically delicious set of three salt combos can help make it happen (metaphorically speaking, at least). A sprinkle of Campfire gives any dish that glorious smoky, cooked-outdoors aroma. Hot Steve is a sophisticated and slightly fruity chili blend that will make your old bottle of BBQ sauce feel like a wallflower at the condiment party. Sultan Papadopoulos, an inspired blend of Greek and Turkish spices, makes a delicious dry-rub and perhaps an even more delicious Bloody Mary. Each flavor is handmade from locally grown herbs and organic spices, and comes in its own beautifully designed, old-timey 6 oz. tin. Handmade in Atlanta, Georgia. Got these for stocking stuffers. Specially the "Hot Steve", my husband's name ðŸ˜‚. They are great! Ran out and ordering more. Hope they like this...sounded like it would be tasty. A friend loves cooking and trying different flavors. I thought this would make a great gift and she loves them! Gave 1 each as little gifts to my friend group for the holiday. All were a success. I bought this for my husband for a birthday gift. He has been experimenting with all three of the flavors on various foods: fish, meat, chicken, veggies, etc. He really enjoys the different flavor combinations and has used the recommendations on the side of the tins to help give him ideas. My fathers name is Steve so I thought the "Hot Steve" would be a hit. They were ALL hits! He opened them all immediately and thought they were all delicious and interesting. I can't wait to taste one of his new creations! They are very generous portions as well. Will last a long time. This salt is some of the best seasoning I've ever tasted. Definitely worth it.